Arbitrator. noun: A person chosen to decide a dispute or settle differences, especially one formally appointed to examine the facts and decide the issue. KJIPUKTUK, HALIFAX - Minister of Health and Wellness Leo Glavine did not like Jim Dorsey's decision and promptly fired him this afternoon. He may not even fully pay Dorsey, he told reporters. Dorsey is the government-appointed arbitrator asked to decide which health care union should represent which bargaining unit once the nine District Health Authorities are amalgamated. In a ruling released this morning Dorsey assigned both health-care workers and clerical staff to the Nova Scotia Government and General Employees Union (NSGEU). Nurses and support staff would have waited for a decision at a later date. Throughout the process Dorsey emphasized how important it was that democratic principles be the foundation of all his decisions. Since Bill 1, the legislation that orders the amalgamation, does not allow for a run-off vote among the health-care unions, Dorsey ruled that existing membership numbers should decide the issue if there is a clear majority. In the case of nurses and support staff, where there is no clear majority, Dorsey reserved judgment until a later date, and kept the door open for a bargaining association solution. Bargaining associations allow multiple unions to bargain collective agreements together and keep their existing membership. This approach has been used successfully in British Columbia, where Dorsey lives, and several European countries. Bargaining associations were also the option all four unions affected by the legislation initially preferred. It would have allowed thousands of health-care and clerical members of the Canadian Union of Public Employees (CUPE) to stay with their union, rather than be assigned to the NSGEU. But it is all water under the bridge. 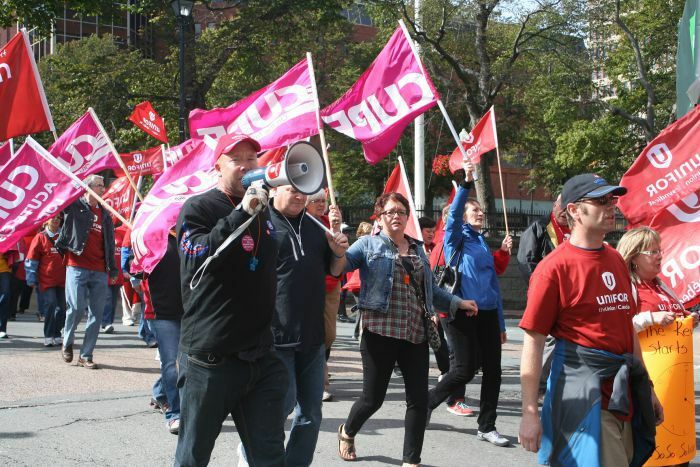 Glavine told reporters that new legislation soon to be introduced will assign health-care workers to the NSGEU, and assign the remaining three bargaining units to the other health-care unions. It appears that never before an entire mediation and arbitration process was rejected in such an offhand manner. But then again there was plenty not to like for government in the Dorsey report. Dorsey sees a recent supreme court decision that endorses the right to form unions as being relevant. The Liberal government vehemently argued that it had no bearing whatsoever on the Nova Scotia situation. Dorsey rejects the validity of a regulation that government issued consolidating the IWK with the new Health Authority, just to give the Nova Scotia Nurses Union (NSNU) a majority in the Nursing Bargaining Unit. At the time Glavine told reporters he wrote that regulation “at the request of Mr. Dorsey.” But Dorsey would have none of it. And Dorsey had a bit of an attitude. “The Mediator-Arbitrator is not simply an usher showing everyone pre-assigned seating," writes Dorsey. “The Mediator-Arbitrator is not simply a facilitator clearing the field and setting up for a new game that has a new player in the mix with old players assigned new positions,” Dorsey goes on. It appears government took these words to heart, and decided it is better off without Dorsey.